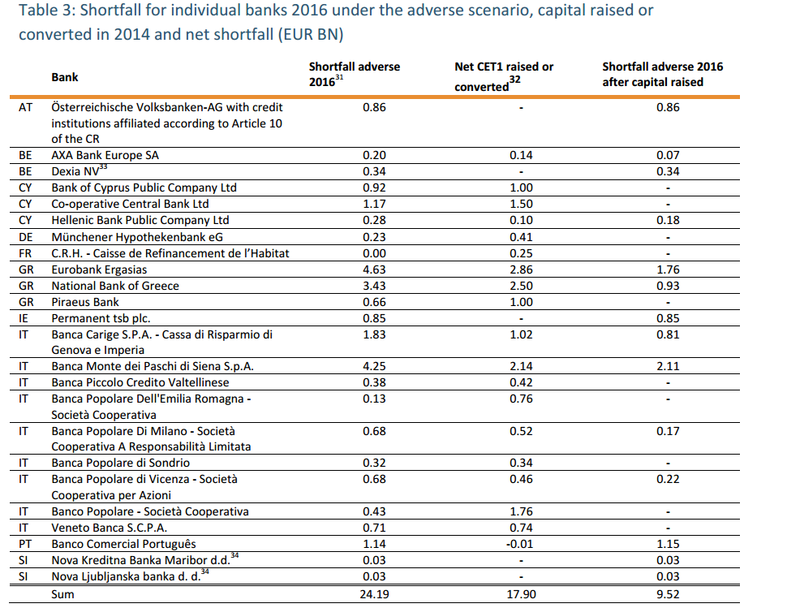 24 European Banks fail ‘Stress Tests’ – 9 of them Italian! The European Banking Authority (EBA), has released the results of ‘Stress Tests’ on 123 banking entities in Europe. The tests were designed to test the resilience of banks to adverse economic conditions. The stress tests are based on common macroeconomic scenarios and a consistent methodology and unparalleled transparency into banks’ balance sheets and the potential impact of severe but plausible shocks on them. The impact of the stress test is assessed in terms of the CRD IV Common Equity Tier 1 ratio for which a 5.5% and 8.0% rate are defined for the adverse and the baseline scenario respectively. Some 24 banks (20%) failed the tests, of which 9 were Italian. Full report available here, and individual bank stress test results and interactive visual display tools here.